30 September 2010, at 12:24a.m. NETHERLANDS - Correct ventilation in pork and poultry farms has always been of great importance for the development of new fans at Vostermans Ventilation, whose Exact Freflow-1 will be on show at EuroTier 2010. Temperature, humidity, the amount of oxygen and discharge of noxious substances (controlled by ventilation) contribute to an optimal climate for the animals. Vostermans Ventilation developed the Exact Freflow-1 system for a steady animal house climate. Applying this system ventilation can be controlled between 10 and 100 per cent. This means with ventilation as constant as possible, an optimum climate can be generated. 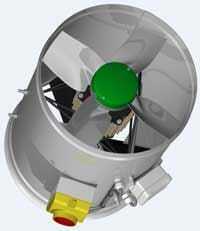 The Exact Freflow-1 system consists of a stainless steel housing with a fan and a measuring impeller. A separate housing holds the control print and frequency controller for the fan. The revolutions of the measuring impeller are used to control the volume flow rate. 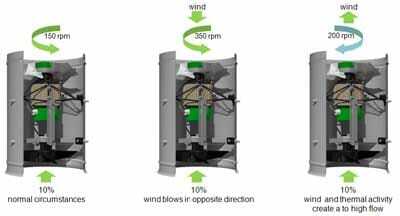 Due to differences in wind speed and/or natural draft, the volume air flow changes, which results in a change of the revolutions of the measuring impeller. By means of continuous control the fan speed is corrected until the measuring impeller reaches the desired number of revolutions. The Exact Freflow-1 system contributes, after correct setting of the climate computer, to maintaining the desired constant stable climate. With continuous measurement, calculation and control the ventilation level in the animal house is kept constant, despite changing conditions due to outside influences. According to Vostermans Ventilation, the advantages of the new system are constant ventilation level control, energy savings of up to 60 per cent and a longer motor life. Furthermore, they are easy to install and to calibrate, and resistant to the conditions in animal houses. They can be used with new and existing climate computers, and no control valves are necessary.